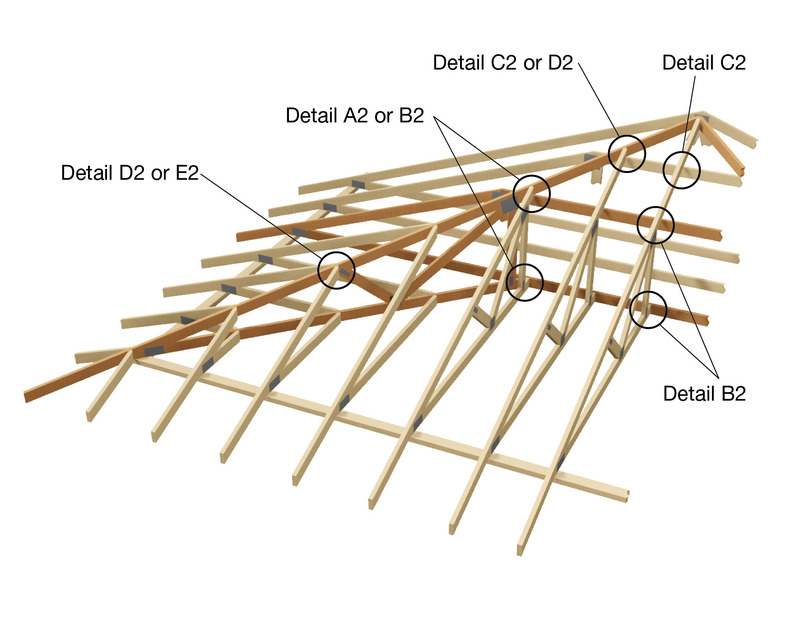 Connection of jack and hip trusses at a hip-end roof for design wind classification N4, C2 or C3 shall be in accordance with the details shown. These details are suitable for a maximum truncated girder station of 3600mm. For effective skew nailing, the nail shall be driven into one member not closer than 25mm to no more than 38mm from the arrea in contact with the adjacent member. The nail shall be driven at an angle between 30° and 45° to the face into which the nail is driven. Where nails are smaller than the nominated size or other than plain shank nails, or machine driven, or both, their performance shall not be inferior to the nail sizes given. Roof battens or purlins and ceiling battens shall be fixed to trusses in accordance with the approved specifications. Where framing anchors or G.I. straps are specified, they shall be fixed in accordance with the approved specifications. 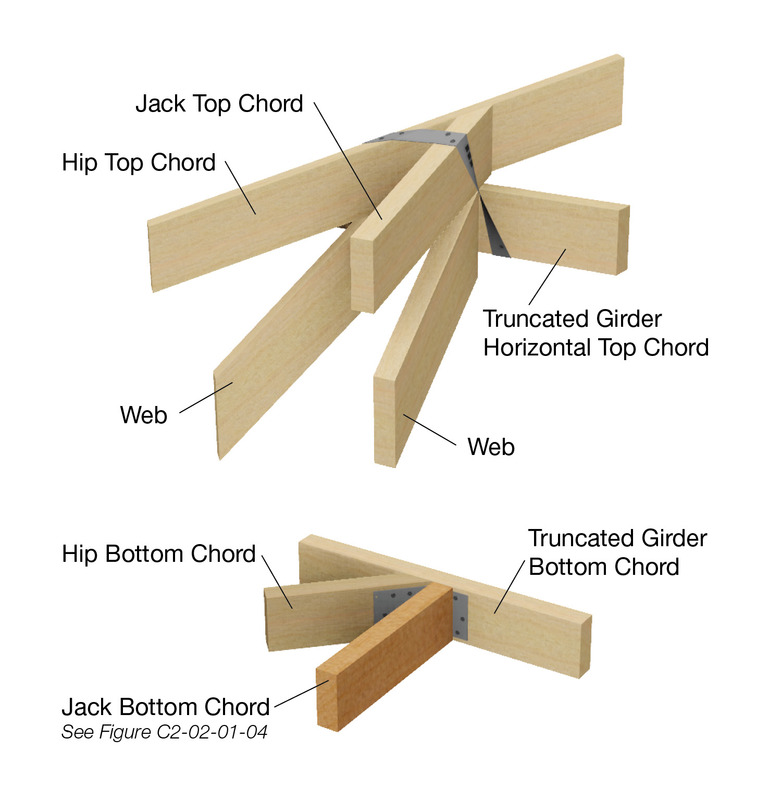 Jack trusses are assumed to be supported on the horizontal top chord of the truncated girder. Hip truss to truncated truss. Top Chord - 1/30mm x 0.8mm G.I. looped strap, with 4/30mm x 2.8Ø reinforced-head nails to each leg. 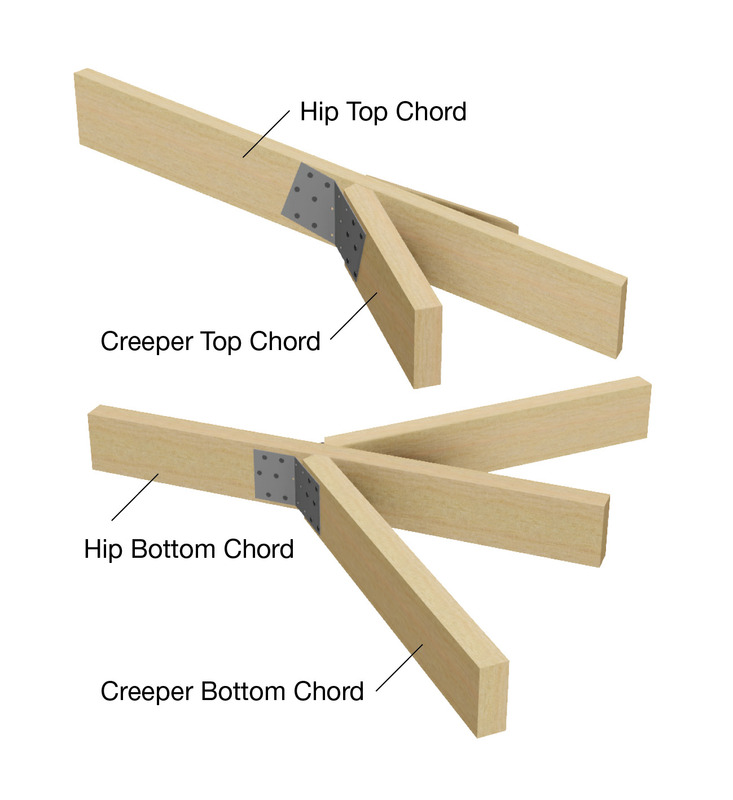 Bottom Chord - use one mitre plate with 6/2.8Ø nails into each face. Jack truss to truncated girder truss. 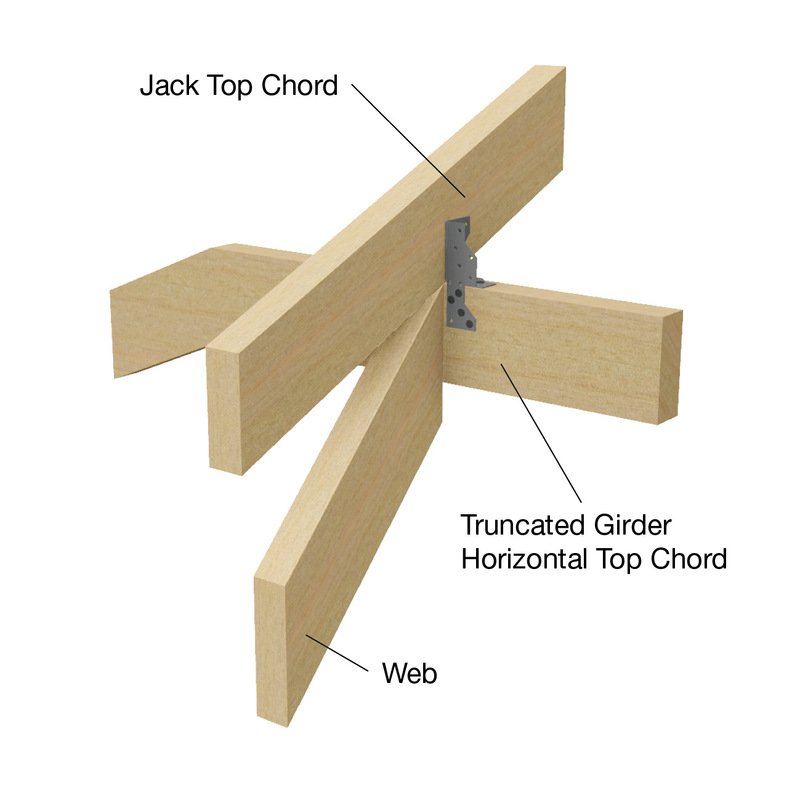 Top Chord -Station up to 2400mm - one framing anchor with 4/30mm x 2.8Ø reinforced-head nails into the side of each top chord. Top Chord -Station 2450mm to 3600mm - 1/30mm x 0.8mm G.I. looped strap bent under the horizontal top chord, fixed with 4/30mm x 2.8Ø reinforced-head nails to each leg. 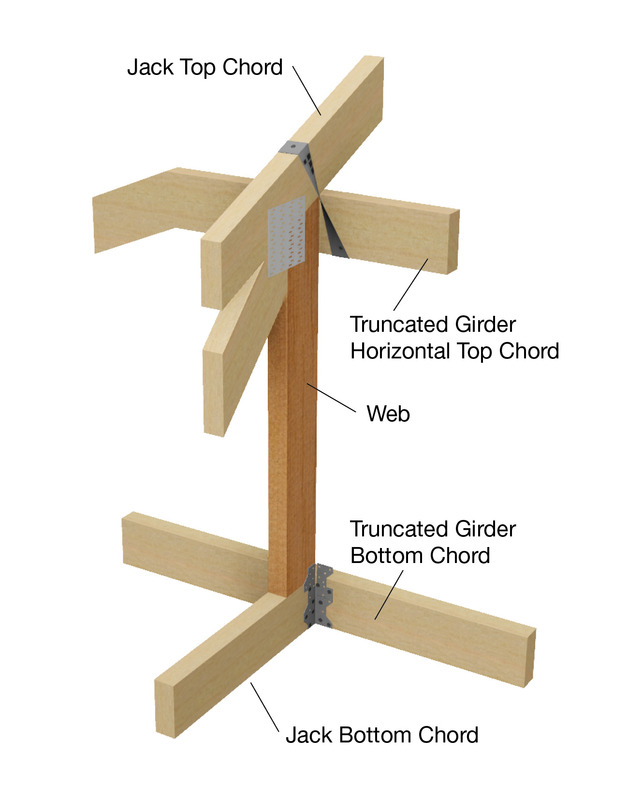 Top chord to truncated standard trusses. 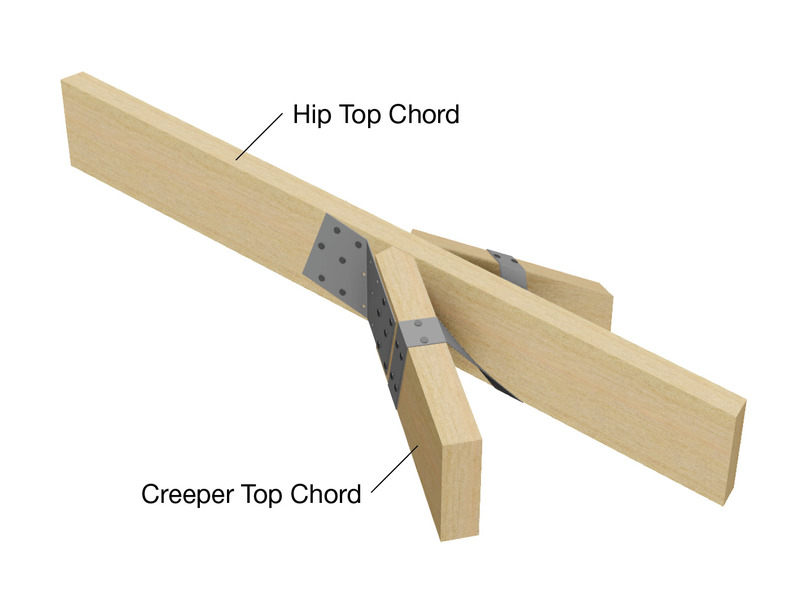 One framing anchor with 4/30mm x 2.8Ø reinforced-head nails into the side of each top chord. Creeper truss to hip truss (maximum jack station 2400mm). 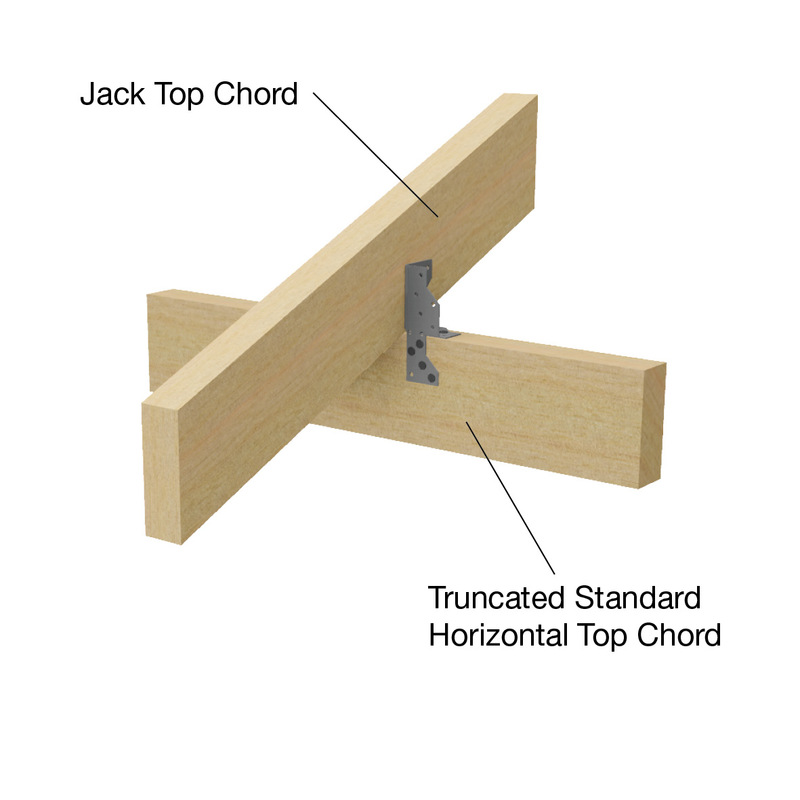 Top Chord - one mitre plate with 6/30mm x 2.8Ø reinforced-head nails into each face. Bottom Chord - one mitre plate with 6/30mm x 2.8Ø reinforced-head nails into each face. Creeper truss to hip truss (maximum jack station 3000mm). Top Chord - 1/30mm x 0.8mm G.I. looped strap with 4/30mm x 2.8Ø reinforced-head nails to each leg and one mitre plate with 6/30mm x 2.8Ø reinforced-head nails into each face.